We have supplied scaffolding for work on heritage sites throughout the UK for years. 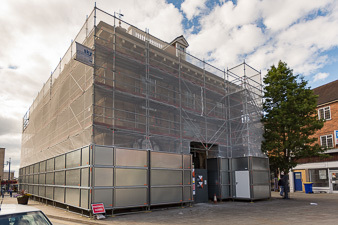 Working on assets owned or managed by English Heritage and The National Trust, we have built up a wealth of experience in providing scaffolding structures for maintenance and reconstruction that are sympathetic to the buildings they adorn. Working on heritage sites often involves working in close proximity to the public and paying visitors. This requires special attention and measures to protect the public while essential works are being carried out, prevent unauthorised access to the scaffolding structure, and providing a structure that is as aesthetically pleasing as possible. We have had great success with our Layher Protect Panel system that can be customised with printed vinyl to match the underlying building and surroundings. 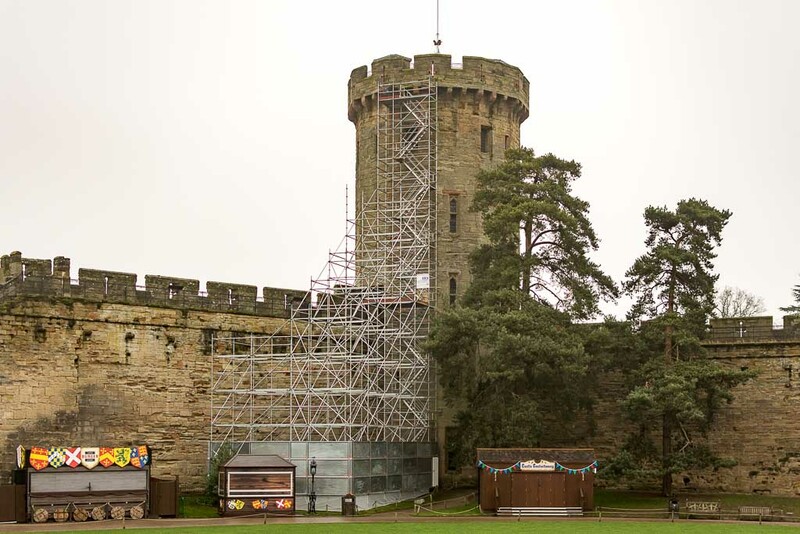 We provided the scaffolding for Guy’s Tower in Warwick Castle. This scaffold required a full-height staircase and integrated hoarding system to provide security and prevent pedestrians from accessing the scaffold. 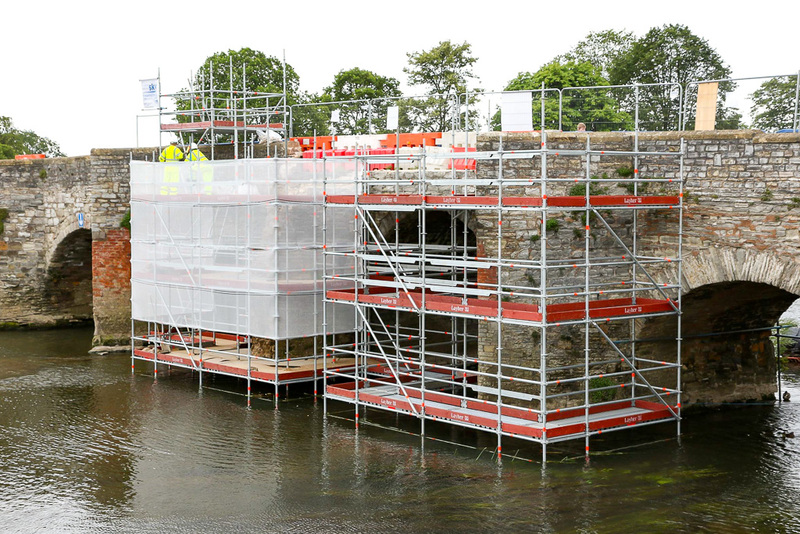 Following a collision on the ancient monument Bidford Bridge, we provided scaffolding out of the water to allow masonry repairs to the pier and parapet. There was a weight restriction on the bridge and we were unable to use anchors to secure the scaffold. 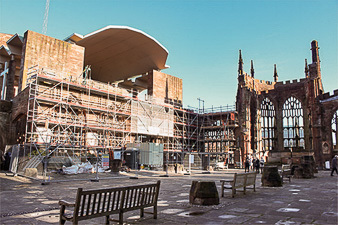 We provided the scaffolding for the restoration of St. Michael’s Cathedral in Coventry. This scaffolding was required for masonry repairs and was constructed using the Layher system scaffold, and the design had to avoid tying to the historic stonework. 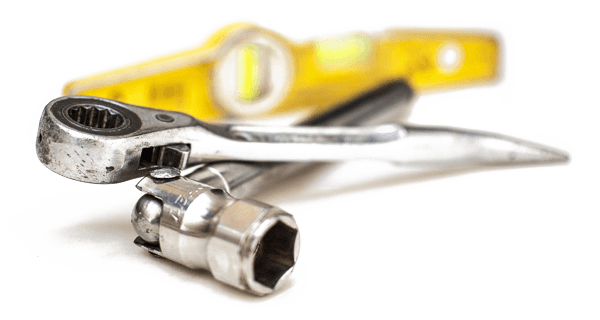 Call our Warwick office on 01926 400 900, it would be great to discuss your requirements with you. This scaffold on Croome Court was for lead work, window replacement, roof work and stonework. The major refurbishment of this Grade I listed building in High Green was made into a visitor attraction and our scaffolding provided safe pedestrian access to see the work up close. This scaffold incorporated a full height Layher staircase suitable for general public use with child-safe guardrails throughout. We provided the scaffolding for masonry repairs to Market Hall Museum in Warwick. We used the Layher Protect System to provide an integrated hoarding system, this keeps a neat appearance, takes up minimum space, and removes the need for timber hoarding to be erected. Sky have a long history providing scaffolding for both reactive and planned council work for a number of councils across the Midlands. 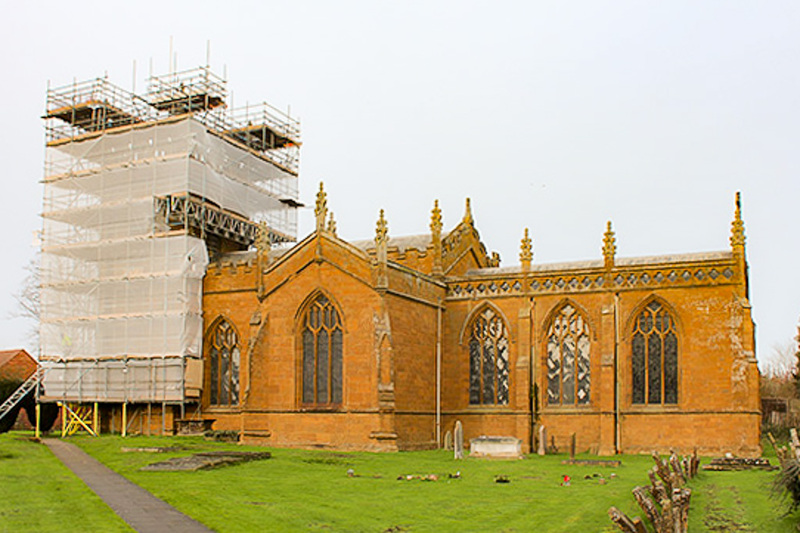 We provided the scaffolding for the restoration of Kineton Church. This scaffold was constructed using Layher system scaffolding with full debris netting. We have lots of experience on heritage works and regularly work on English Heritage and National Trust sites.